What does Padmavathi mean, details, origin, short & easy attributes? Means "resembling lotuses", derived from the Sanskrit word à¤ªà¤¦à¥à¤® (padma) meaning "lotus" combined with à¤µà¤¤à¥€ (vati) meaning "resemblance". This is the name of the foster-mother of the god Hindu Skanda. Padmavathi is baby girl name mainly popular in Hindu religion and its main origin is Hindi. Padmavathi name meanings is Goddess Lakshmi. People search this name as Padmavathi. Padmavathi is written in Hindi as पद्मावती. Other similar sounding names can be Padamavati, Padmavasa, Padmavati. Each letter meanings in Padmavathi Name. Popular personalities with Padmavathi Name. 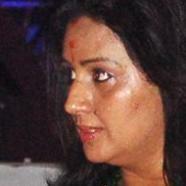 Menaka G is an actress and producer. Her most notable accomplishments were from 1980 to 1987. Menaka was given the name Padmavathi in 1963 in Nagercoil, Tamil Nadu, India.